I did promise, rashly, in my early morning optimism and energy, a new blog tonight, saying I even thought Kitty might take a few pictures, to which, I would no doubt, add some lovely comments. ME: I said I would do a new blog with pics tonight, by you. ME: Yeah, we do, it's 8 and we are not yet done for the day. Speaking of which, honey harvest is tomorrow! We gather (Read: Steal) all the extra honey, and extract it, and settle the little darlings for the winter, so last Bee Blogs are coming soon. My friend Marilyn, aka The Cat Coach has an article in USA Today on Kitties, and them being indoor cats, what to do, how to keep them happy and lots of fun ideas. Read it HERE. Marilyn is also the head of the California Bengal Rescue Network, and she is heading up a rescue effort to save 35 Bengals. 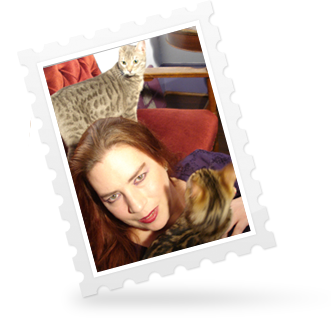 These are lovely Bengals, from a breeder who could no longer afford in these times to keep going. They are not problem children, and all are SBT, meaning F4 or higher, and considered domestic. They are lovely, and if you are in the area, and would like to bring one into your home, or even foster until we can find their people, please, contact Marilyn at the e-mail on the site. You will not regret it, and if you do, your life will be full of more love, joy and interesting moments than you have ever known. They need you. Please take a look and forward to anyone you think might help. I am happy to talk Bengal with anyone, and if you need more information, or advice once you have a Bengal, I am here. I bet Venus is claiming Kitty as her own by sitting on her. Busy busy bees are bee-ing tomorrow! Sounds like you three have your work cut out for you this week! Have fun with the honey harvest; don't let 'em see any fear. Really looking forward to the bee blog. You almost make want to be there to help (not confident I wouldn't panic, hence the "almost"). But I sure enjoy reading about the bees. Can't really say much; this is more a drop-in to say Hi, but good wishes for the Bengals ... and for Boss as he heads off to China ... I have to go to bed, but I'll be here tomorrow. Good-night. Wait - that makes me sound like a stalker - I'm going to bed, too, in my own house, which is thousands of miles away from EL. Oy, those Bengals had to be in CA, didn't they? You're an Evil Temptress of the First Order, you are! And with Bees, there is no fear. Not in the list of options. One does. And that is it. Breath? This week? Not likely..But next Tuesday? Full on day OFF!!!!! I am going to ride, go out to lunch and SLEEP. Gigs this weekend too, Friday and Saturday, with Miss Kitty, come down! 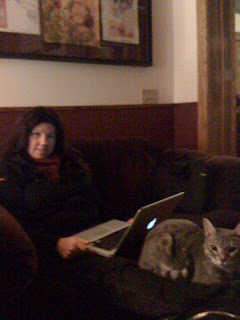 Gigs and Kitty! You're going to bring down the house! Wish we were a bengal house but we're not. Just not cut out for it. Saturday I will be performing a wedding for a dear friend. I'm sooo excited. We've known each other for 15 yrs, his bride is awesome...Big fan of Boss so we hit it off immediately. I was going to throw some quote into the ceremony but didnt' have time to figure one out. The rest of the time I get to toodle aroudn portland...yippee! I love that town! busy with doggie shenanigans here. Yes, do remember to breath Q, we like to have you in the land of the breathing. i'm excited to read bee post as well. good luck in this week of busy and please do stay in the land of breathing. Bees, gigs and Kitty? Plus a smattering of kitties? (Not that I am not happy - nay, delighted - to be finally at home and not moving for a full week, mind). Hugs to bees, Kitty, Paul, cats and horses (not necessarily in that order). And to YOU (see what I mean about hugging order of precedence?). Another bee-post? I shall look forward to that. I wish I could be there to try my hand at honey-theft, too! Morning! Have fun bee-ing (and Being - at least if life is full for you this week, Q, it's full of Good Stuff). Good morning (Phiala Local Time, of course)! Here's hoping today is a good and productive day all around. Unlike yesterday, which was a disaster. Good morning. Xander is all better, and so far no one else has come down with the 24 hour flu. You know how some projects take on an overwhelming dread all out of proportion to their actual significance? I just tackled one of those, and I won. Still a bit of final cleanup, but nothing horrid. Finally at a real computer. So tick! Yay for conquering the Dread Project Robert! Hooray for all the good news flying about. Phiala, I know exactly that experience of having something too- dreadful-to-be-contemplated turn out to be a relative non-event. Such a relief when they dwindle to their real size. Quiche- You are breaking down my no-cat barrier! I was just thinking, well, we've got a lot of space here, and Bengals are No Ordinary Cat... But I must resist; I won't let myself get a dog because we can't afford one and don't have time. Have a fiendly day, lovelies (or a lovely day, fiendies, either way). Katie, think about it, and then ask for two Bengals. They will be together and are better than one. You will love them, and they are WAY less work than a dog. And they are not ordinary cats. That's what makes them wonderful. I'd never seen that poem! I thought I'd read every blog post ever. I will use that, thank you Marjorie!! Had a dream last night that I was staying at your house Lorraine...but it wasn't actually your house because dreams are like that...but everywhere I sat a kitten crawled out from under a blanket or chair or somewhere! Boss popped by, sat in a bean bag chair and talked about China (no idea what he said). And I did dishes. Dreams are weird. maybe we should wear shoes, Quiche, instead of letting bees crawl on our feets. that you nicely made sure i had. and blueberries. I want King Lear to come to work with us today. I read the poem to hubby and he said, "wow, that's really nice...he should really think about becoming a writer"...har har. I have been very very away, trying to make my house liveable and doctoring the rescue critters who seem to be attracted to my house. I think my dog invites them, really I do. I joined the Pierce County Beekeepers, and am so excited to go to my first meeting next month, so I am extra exspeshully interested in the bee posts. I have forwarded Bengal info to my baby sister in California, she will pass it along, too. I have a big skull piggy bank (that sounded funny, hmm) by my front door, with a banner reading 'A fiver for Hope' on its' forehead. My in-person fiends have put in a fair amount of change, which I am taking to the bank to get turned into a cashier's check for the Cali Bengals. Good luck with all your busyness, Lorraine and yay for a fabulous houseguest! I had one of those this past weekend, my own self. Y'know, it occurs to me that I really can't say I don't have time when you clearly have Bengals/Bees/Boss/Band/Bhorses(?). But, I should probably meet a Bengal in real life first. Like you've taught, know what you're getting into; all I know are your stories. And it occurs to me that I do have a Bengal question that I don't think I've seen. Magic is first generation, The Royals are second- How do you know? Is it a benefit that comes of going with a Bengal specific rescue, or is it largely guesswork? What are the odds that someone could think they're getting a 4th or later gen. but are really getting a 2nd or 3rd? I imagine that could be a bad situation. There's a black cat stalking the neighbourhood lately. I initially thought he belonged to someone, but now I don't think so. Knowing that Hallowe'en is coming and the kinds of things that happen to black cats this time of year, I think I may go make friends with him. Bees and Kitties (of all persuasions) abound. What fun. I hope you enjoy your day off tomorrow and I'd like to add my round of hugs to Natalie's. You pick the order. Pupils are driving me mad! can't wait for the bee post! Good luck for you and all the work to be done! Because I'm weary in the head and skimming comments, the only words that have stuck with me are bees and feets. Which in turn makes me think, Bee Feats. Now I'm trying to think what kinds of feats bees would dare. Flying straight for a fencepost, then ducking around it at the last minute? I don't know. Happy week. Happy work. Happy beeing. So, Spaced, if for some reason a Bengal hasn't got its papers that there's no way to know? Like with registered horses? I did take a look at the GLBR site, and since I live in Iowa, it looks like I'm in their zone, which I didn't realise. I am definitely going to have a word with my husband about fostering (after we get the house we moved into looking like a house, not a furniture store). Saw the movies on Twitter, can't wait for bee blog! Bee post is coming! Working on it now. With Bengals, most breeders know and pass on pedigree. If it is not known, you can tell. The early generation look and act much more like the asian leopard cat, google image some. Smaller heads, rounder ears, shorter legs. Way more timid. And the eyes are freakier. If one knew Bengals, one could tell pretty closely what gen one was. There was a women out east recently whose vet had an F1 abandoned by a breeder, and he passed it onto this women who had always wanted a Bengal, but she had no clue it was F1 and had NO idea what to do with it. A home with someone experienced was found for the poor guy. The later gen look, and act much more cat like. Freaky-cats, but stil cats. Kind of. Right, back to the bee blog. Well, if anyone is still around, the Bee Blog is UP!